Mangaluru, May 10, 2015 : Minister for Urban Development Vinay Kumar Sorake has said Mangalore City Corporation Commissioner and corporators will work in coordination for the progress of the City. Differences if any have been resolved for the present in the interest of work progress. 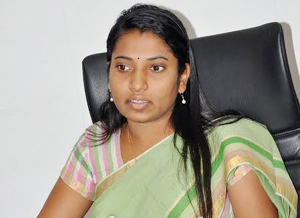 Corporators had expressed their dissent against MCC Commissioner Hephsiba Rani Korlapati in a closed door meeting with the minister. The corporators have alleged that the commissioner does not take the corporators in to confidence while initiating development work. The corporators have alleged that the commissioner is not responding to the corporators. "We are not demanding transfer of the Commissioner. We want due value and respect and take us into confidence while taking up any development work," said a corporator. In fact, a delegation of corporators had complained to Chief Minister Siddaramaiah against commissioner during his visit to Mangaluru on April 24, it may be recalled as reported in this site.